As you may have noticed, I’ve been MIA for a few days (ok, 11 to be exact), but after I got back from my Christmas trip to Berlin, it’s been non-stop eating, sleeping, travelling, sleeping, drinking, sleeping… well, you get the picture. I’ve been crazed. I got a little over-excited that I had a whole 17 days off work and acted accordingly. But I’m back just in time to get one or two final posts in before we get acquainted with 2012 (she’s gonna be a goodie, I can tell. She feels nice and, well, even). I wanted to round up the fashion choices that our celebrity friends have donned this year, highlighting those who were sartorially superior, those who have clearly realised that help from stylists is necessary, and those who we have not seen the best of yet. Without further ado, onto the first category. Camilla Belle is hands-down the winner of the best overall red carpet style. Always flawless, always classy and always polished. Damn her and her shiny hair. I mean, congrats. Saldana is always someone I look forward to seeing on the red carpet, and she never lets me down. Sometimes her choices are a little out there, but she never fails to carry them off. Shorts on the red carpet? Bring it. 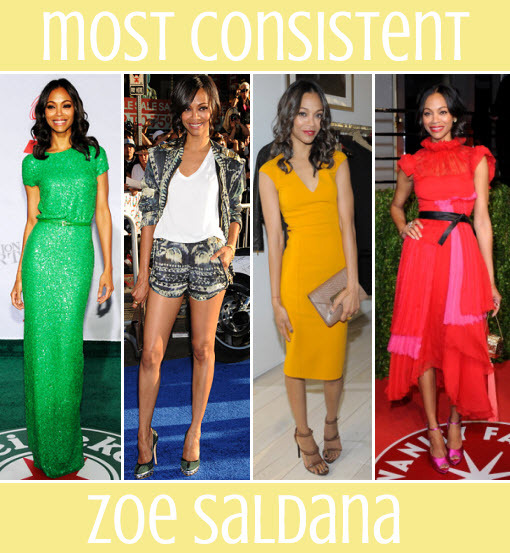 Forget Aniston’s love-in with black, Saldana will try every colour in the rainbow, every length, every fabric. This lady is never predictable, but consistently spot on. 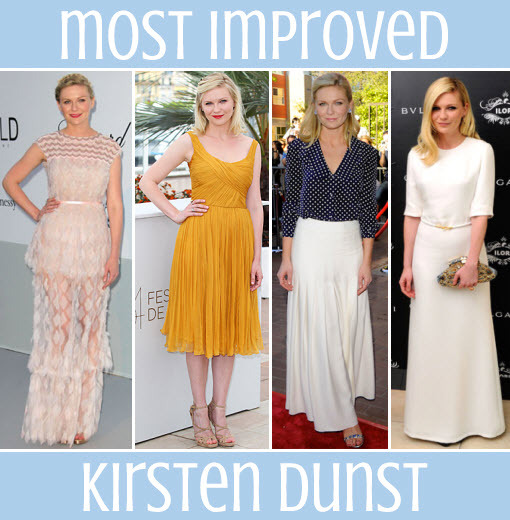 Dunst hired a stylist! And bought a hairbrush! And a mirror! This year has been a style resurrection for The Artist Formally Known As Drunkst. Obviously a bit of Chanel will help anyone, but she’s adopted a new softness that makes it work. When she stepped out at Cannes, there must have been a collective, “who, now?”. Long may it last. Kerr doesn’t just nip round to the corner shop in a hoodie, jogging bottoms (oh, the irony), and 5-year-old Uggs. Oh no, the pavement is her catwalk. Neutral colours, a well-placed scarf and some arm candy, this look is 100% ‘off-duty model’. Which usually works best for models. Cruelly. This year Rosie H-W has found out just how many dresses are involved in a promotional tour, and J-Lo has discovered the fountain of eternal youth. Both know exactly how to dress to accentuate, erm, assets, and both are the reason why I shall be eating nothing but broccoli in January. Cheers, ladies. Now for the biggie. The best dress of 2011. I couldn’t choose just one, so they’re going to have to split the award (I’m sure Kate will understand, she’s very charitable). Firstly Mila had an amazing year professionally and on the red carpet. Far from letting Portman romp home with her effortless style, she came out all guns blazing and particularly impressed with this red Alexander McQueen at the SAG Awards. Her whole look was perfection. Then there was the small matter of the Royal Wedding (pah! Small?! I loved every minute – see here) and The Wedding Dress… as predicted, Kate went for Sarah Burton for McQueen and looked beyond stunning. It was an absolute triumph, and for those who say that her thunder was stolen by Pippa, I say you’re wrong. Lastly, Lively has had another fabulous year (being besties with Lagerfeld, Louboutin et al probably doesn’t hurt), but for me her stand-out look was this Grecian-inspired Marchesa gown. My fiancé commented that it looks like she’s wearing a bed sheet, but that’s the fanciest bed sheet I’ve ever seen. Oh lord, can you imagine if Marchesa made bed sheets…?! I totally would. So there you have it, my celeb fashion round-up of 2011. And hey, I didn’t even mention Palermo or Kruger once! Oh. What were your fashion highlights from this year? Any predictions for next year?